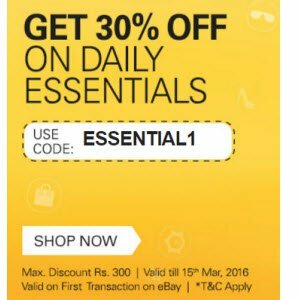 Hello Dealsnloot Readers,Get flat 30% off on your daily essentials using this offer. This offer is available for limited time period. Just click get an offer to avail discount.Grab This Loot Offer and get Your Product In Low Price.Wait is over for new ebay users offer, Get 30% off on daily essentials when apply code ESSENTIAL1. Click here to open offer/product page at eBay.